The last valley in Central Bhutan, Ura Valley, is also the highest in Bumthang. Wide open spaces characterize the valley that sits In the shadow of the Thrumsingla pass, separating the East from the West of the kingdom. Ura village and its new monastery are a charming stop before the climb to the East. Cobbled streets and a medieval feel give Ura an unusual yet very attractive atmosphere. The old women of Ura still wear sheepskin shawls on their backs which double as a blanket and cushion. 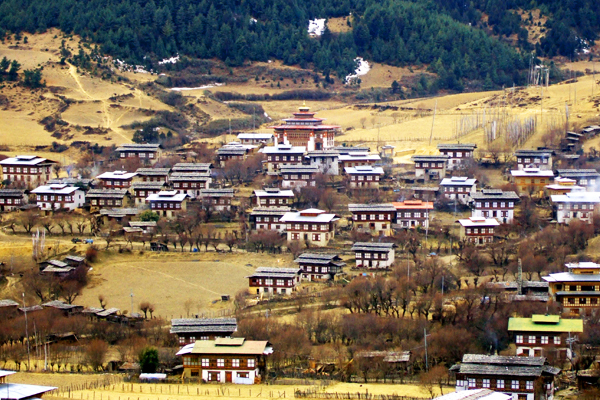 Ura is a town in Ura Gewog in Bumthang District in northeastern Bhutan.Located in a broad valley (3100 m), Ura is the highest of the four valleys in Bumthang district. 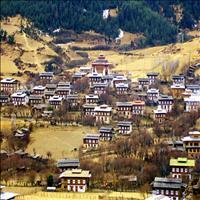 It is about 1 ½ hours drive from Bumthang towards the east of Bhutan. Situated at an elevation of 10,170 feet, Ura is quite a large village with closely packed houses along the cobblestone paths that give the village a medieval atmosphere. Overlooking the village, there is a newly built temple dedicated to Guru Rinpoche which contains his gigantic statue and the remarkable paintings of his teachings. The village breeds yak and sheep, and potatoes are now an important cash crop. A visit to this village will give you close contact with people and their village life.